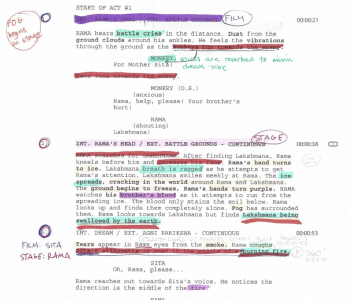 The script was initially designed to incorporate technology and more specifically, weave it into the story as developmental tools. The goal was (and continues to be) to integrate and intercept technology and live theatre/film. Since we are on the forefront of this field, the majority of the work is done in house by ourselves and our software developer. I personally have been working on the third (and hopefully final!) iteration of the Multimedia Augmented Reality system — or as we call it, mARs. This post will delve deeper into the programs that we developed and the hardware that we used over this nearly 2 year long project. The first idea (and the easiest) was to use an Arduino, BlueTooth, and a host computer running a program written in Unity/C#. Why Unity? Our lead software developer was very familiar with the program and VR applications. Since this project merges VR with multimedia, this turned out to work incredibly well. However, we ran into issues with BT (more specifically the virtualization of com ports) and the portability of the system. We initially used a TinyDuino with the BlueTooth module as well as the 9-axis IMU. The program that we wrote took the data straight from the gyroscope and sent it over the serial port. From there, Unity read the serial port just as fast as we sent it and moved a virtual camera around 360 degree video. Think of VR without a headset. Of course, we were overjoyed when this finally worked. So what went wrong? Unfortunately, many things were not perfect. Due to the nature of BlueTooth, we had multiple issues with the location of com ports and the packagability of the entire system. I decided that it would be interesting to see if we would be able to reduce the amount of computing power required to run our software. I knew that we were locked into the Unity system and we needed to reoptimize the code to run on lower quality/portable devices like a Raspberry Pi. The next goal was to make our code run on a Raspberry Pi and create a bridge between the Arduino and the RPi USB ports. Our Raspberry Pi 3 Model B+ wired with an analog video transmitter. We looked at the compiling options in Unity and we determined that we could compile the program for ARM processors and specifically Windows IOT. We chose to use a smaller, more portable SoC because I wanted the entire device to run on the actor — to show how the technology could easily be integrated into any multimedia show. Due to this requirement, we needed to get wireless video. Our first steps were to exploit the Raspberry Pi’s analog video out and use a recreational 5.8Ghz video transmitter for wireless video. This turned out to be the easiest part of the entire build. Once this was accomplished, we attempted to compile the program for the Raspberry Pi. Test of the wireless 5.8Ghz video with a professional grade 5.8Ghz ground station receiver. Unfortunately, Windows IOT (at least for us) was terrible to work with. We were unable to run our program on the platform, most likely due to the performance demand as we changed very little in the code. Soon after, we abandoned the idea of using a RPi since we were unable to code for ARM processors natively. For us, at this time, we believed that we needed to find a device that was in between a Raspberry Pi and a laptop. In other words, the device needed to be: x86 compatible, run Windows 10, be very portable. Part 2: LattePanda, because who doesn’t need more coffee? By now, both Zeezee and I were attending our respective universities, far enough away from each other that work needed to be split up into two teams. I formed my team with an experienced Arduino programmer and we delved into the depths of the LattePanda. However, this time, Zeezee and I had a much larger due date: The AISNE MS Diversity Conference. We planned for the announcement and demonstration of our technology at the conference so we geared up for working hard. 3D Printed case designed in Fusion 360 for the LattePanda. I chose the LattePanda because it seemed too good for what we needed. Approximately the same size of the RPi, more powerful, runs Windows 10, plenty of GPIO with direct access to the IO on the Intel processor, a built in Arduino Leonardo. The list goes on and it makes it seem ever better the more we read. We purchased the LattePanda as well as a multitude of accessories. I redesigned a 3D printed case based on the design for the Raspberry Pi and printed it at my university. Part 3: Why are we moving on from this application? Unfortunately, the good news and potential for the LattePanda died off exponentially as the days went by. My team and I learned that programming for the LattePanda was much harder than expected, especially since the documentation was not great and the user base was smaller than we thought. static Arduino arduino = new Arduino(); // We thought this snippet was hilarious. We wanted the LattePanda to be great. I know that if we continued to work with the platform, it may work but due to the cost of the device and our ability to break things, we cannot continue with the development of the platform. After the conference, we would take a break from the project and reconvene during our winter break. The further I thought about this, the more it seemed reasonable. Many products use ‘the cloud’ to process real time data (i.e., natural language processing) so would this be possible? From my bot that I was previously working on, I was running the bot on a virtual machine on a Google Cloud Compute Core. This gave me the idea to look into IOT running on the Google Cloud platform. I tossed the idea around with our lead programmer, Harry. While he figured it was a backwards route (which I completely understood and previously knew), he was intrigued with the idea of off loading video compute power to ‘the cloud’. We discussed the potential issues with the idea and we kept running into the issue of encoding/decoding video nearly instantly. From our experience, we determined that the latency between the gyroscope and the projection needed to be no greater than 500ms or half a second. This will most likely be the hardest part of the programming but we will find out once this is completed (or near complete). I believe that we can get to the h.264 Encoder part of the flow chart. However, I do not know if this iteration will ever be complete. Harry and I both agree that whether or not this will work, it will be a learning experience for both of us. We do have a plan B if this does not work by our expected deadline (August 2019). We will continue to work on this and I personally will begin development of the gyroscope uplink to Google Cloud. We will continue to update the GitHub as well as the blog with any and all data that we have! Back in 2016 when I first discovered the Ramayana (translated by William Buck), I was surprised at how little the text explored Rama’s thought process after hearing about the rumors of Sita’s impurity; although Buck’s version is an abridged translation of the original text, the mystery behind Rama’s decision to banish his wife over a controversial rumors still remains. In attempts to find justification for Rama’s actions while preserving my optimistic attitude towards his selfless character–he is just trying to do his best at filling the role destiny set for him–I wrote Oha the Prodigy (see below). Although the scene is quite fictional and not written in the same perspective of the original text, Rama’s decision making is left up to interpretation and my proposition of his thought process is quite possible. 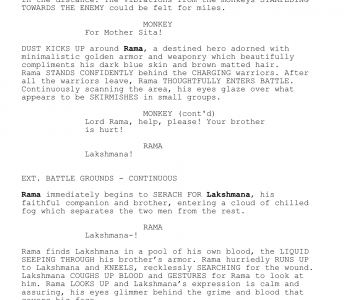 Below is the original story of Rama and his second personality, Oha. 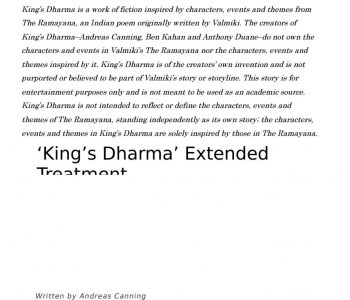 Much of my original intention of his character remains in King’s Dharma because Oha allows for me to explore Rama’s psyche as the Avatar faces being the “Perfect Man.” Oha’s character gives me the flexibility to demonstrate the immense pressure destiny has on Rama’s attempt to not just exemplify the “Perfect Man,” but in his ability to be human. By writing outside of the original perspective and voice of William Buck’s Ramayana, I can better exemplify the fundamental allegory of Rama’s story: the duties of being human. Zeezee and I attended the AISNE Middle School Diversity Conference at Dedham Country Day School at November 10th, 2018. We were invited as keynote speakers where we talked about King’s Dharma and how we are using our voice to talk about identity and how King’s Dharma as our medium for voice. We had a great time and got to speak along side Shantae J. Edwards, a marvelous speaker! We were overjoyed to talk with her after the conference and she inspired us to continue to push to work at a more professional level. Thank you AISNE for the opportunity to speak! We look forward to working with you in the future! New Site, New Tech… New King’s Dharma? So let's be real: there's a lot going on. With Zeezee and Ben both leaving for college, (NYU and The University of Rochester, respectively), there's unfortunately been a pause in the development on the show. However, that does not mean that neither of us constantly think of the show! As you may be able to see, the website has changed drastically. We have moved from Squarespace to WordPress since it is cheaper to host and offers more room for growth if we ever need it. Plus it's cheaper and we're poor college students now. By a "new King's Dharma" this is what we meant. It's just a facelift, nothing more. Some may call it clickbait. 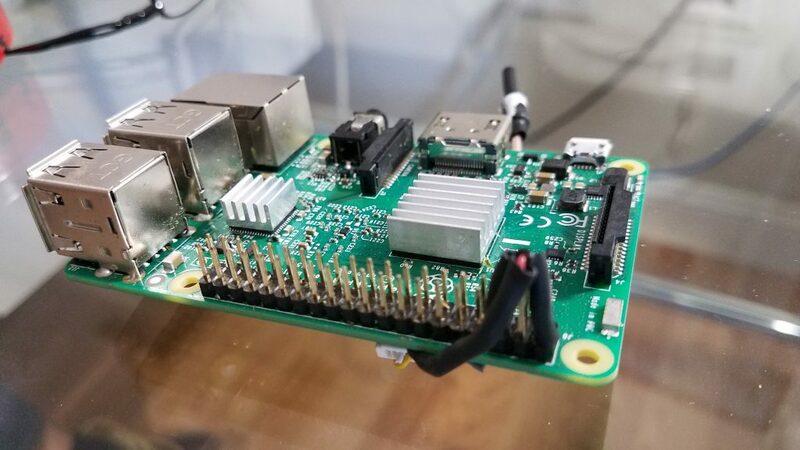 Raspberry pi to what now? Other things have changed too. 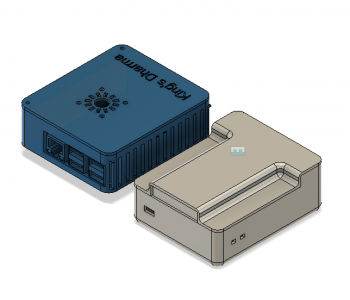 There's been a recent development on SoC mini computers and we have been able to locate one which is around the same size as a raspberry pi. This means that we will be able to run our in house developed program on the actor themselves without having to run wires all over the place and mess around with Bluetooth technology. This benefits us greatly and we are working on it! 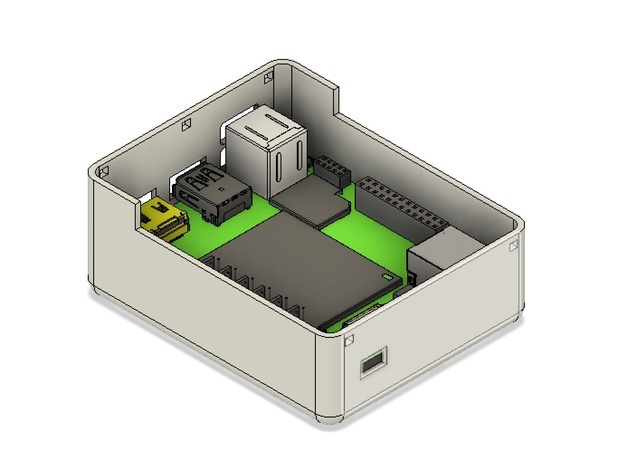 Ben has already developed a case for the components as well as working on the reprogramming and redevelopment of our software for the new SoC. Oh yes. 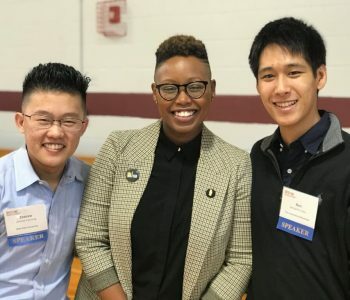 Zeezee, through his connection from his alma mater, was able to get us a spot as keynote speakers for the AISNE MS Diversity Conference at Dedham Country Day school in Dedham, MA. This November 10th, Ben and Zeezee will make the long trip from New York back home to present King's Dharma as an exploration of identity and voice. This is the beginning of what they hope to be a future of presentations on the show and the technology that they will be using for it. Due to the potential impact of the conference, the E-Board team is looking to self publish the script as a way to introduce it to the greater educational and theatrical world. If successful, Ben and Zeezee will have this under the donations page on the website. And that's about it. There's not a lot that has been going on but it sure feels like it. Currently, Ben and Zeezee are prepping for the conference and there are many things have happened because of that. Basically, they got moving again because of the conference. A win win right? We will continue to update the blog regularly now! You should hear from Ben and Zeezee at least twice a week from now on. Our first printed version of King’s Dharma where we read through the entire storyline by line. Notes were taken by Zeezee.